In conjunction with the above, we are setting up a booth at the venue, Damansara Utama Methodist Church in Section 13, Petaling Jaya. Click HERE for more details and location map. The exhibition will be from the evening of August 14 until lunchtime August 16. We welcome you to our booth no. 12. It is situated outside the main auditorium's side entrance and opposite the security office. 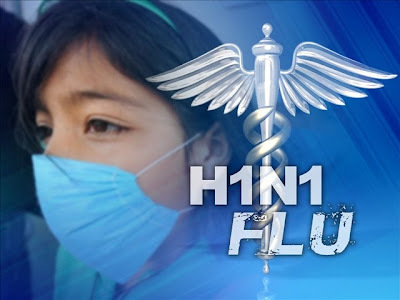 3 months after the dreaded A H1N1 virus surfaced in Mexico and begun infecting humans, the sourge has made almost 200,000 people worldwide ill and killing over 1,300 of its victims. Although it is pandemic it is not a killer but we have not paid sufficient and serious attention to stop its multiplication. In Malaysia we have recorded almost 1,500 cases of imported and locally transmitted infections, over half of which are now locally transmitted. Of these we have already read of 11 deaths, 3 of which are within the past 24 hours. It is a worrisome trend. Any gathering of people in close proximity can give rise to cross infection and must be grounds for preventive actions. PBSNS has 25 trainees and up to 4 adult trainers and volunteers at any one time. Until today we have had little concern as none of our members have reported sick. Today we have a trainer who was ill, not seriously but he has been advised to self-quarantine and seek medical treatment if he does not recover in a day or two. Some trainees are coughing and the instruction given out is that parents with trainees who are unwell (cough, sneeze, fever) must not send them to the centre. If they do come they will be sent home to minimize exposing the other trainees. Trainers and volunteers who are unwell should inform the centre and be excused. In the worse case scenario, if a large number of the trainees and caregivers are unwell, be it from normal flu or H1N1 virus, the centre will have to be closed temporarily to mitigate the situation. We will watch for further developments and act accordingly. We pray for the Malaysian Care 30th Anniversary Exhibition next weekend in Petaling Jaya in which we plan to participate, that our staff will be well to attend, that the various participants in the various events will not be afflicted with flu of any sort. To say that I was not nervous in chairing my first AGM would be untruthful. It was my first experience and I have to be sure I followed the constitutions of the Persatuan. The very first thing I was to ensure is the quorum. The constitution requires no less than 10 out of 19 members to be in attendance and we had 14 so the AGM proceeded as planned at 11am today soon after the committee meeting ended. Being our first AGM the agenda was simple: adopt the minutes of the inaugural AGM, presenting the chairman's and treasurer's reports and dealing with matters for which sufficient notice was given. The members present discussed the issues at hand. They were updated on the latest development on the acquisition of the building adjacent to the centre, and proposed plans for its future development. The meeting ended at 12.30pm on a high note. The coming years will see significant expansion of the work of PBSNS and lots of work to be done. Somehow I felt God's partnership in this work very positively and believe that the building fund that we will be launching will meet with good support. On June 20 the Persatuan will hold its first AGM since its inception on April 5, 2008. The Persatuan began operation in August 2008 and took over the full work from Pusat Berdikari Seremban or PBS from January 2009. The audited accounts for the period July - December 2008 has been finalized and my annual report as chairman of the Persatuan is in its finishing stage. In order that the AGM will be meaningful I hope that most if not all the members will turn up for the meeting at 11.00am at the Wesley Church office (above the centre). If you are a member of the Persatuan please consider this a gentle reminder to attend. This afternoon I attended the dedication service of the Beautiful Gate Foundation for the Disabled (Seremban) new building in Mambau, Seremban by the Rev. 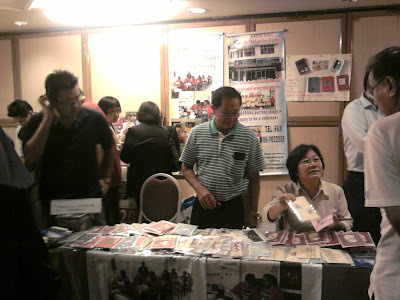 Boh Che Suan, President of the Chinese Annual Conference of the Methodist Church in Malaysia. The BGF is a community project of CAC for those who are wheelchair bound and trains them in useful trades. They have 6 centres throughout the country. An important date has been etched in the history of the Persatuan today when we received a group of 11 Rotarians from the Seremban Rotary Club and the District Governor, Dr Rajindar Singh and his wife Surendra (also a Rotarian) who were here on a gift bearing mission. They came to present us cheques for the purchase of a sealing machine and an electric oven which will be used in the straw packing and bakery projects respectively. The value of their donations is RM4100 and we wish to record our deepest appreciation for their charity towards our work. We also wish to record our thanks to Dr CS Paul who is a member of the Seremban chapter of the Rotary Club and initiated this donation. 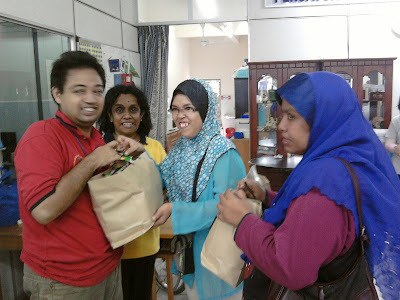 We believe that a new chapter has opened in the cooperation between ourselves and the Rotary Club Seremban. The Rotary District regularly receives funds from foundations to disburse to worthy causes. We hope that we can be counted as one of their beneficiaries in future when we need to equip our new centre. We had a surprise visit from a very interesting group today. 9 members from the All Souls (Anglican) Church, London, dropped by for a visit to understand our work. 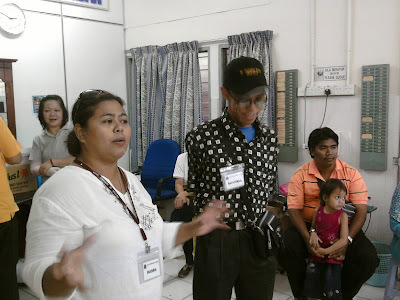 They were in Malaysia as part of their mission work to help a local church carry out some local mission and local church works. They helped build a house for a Sengoi pastor, led in worship and taught English to the Vietnamese community here in Seremban. Coming to PBSNS is a 'bonus' as it was not part of their itinerary. We gave our visitors a briefing and showing them how the trainees carry out their work. In case you are curious, the multi-national group comprise members from England, Northern Ireland, Germany, United States, Brazil, S. Korea, Hong Kong and Malaysia. I just decided to revisit this link to understand the nature of our work lest we forget. I would like to pick up some statements that impress me (with comments added in italics). My Comment: How do parents know if their child is learning disabled? A child who suffers from poor eyesight can visit an opthalmologist for comprehensive tests but where do a child with suspected learning difficulty go for evaluation? Often parents are ignorant of available facilities and are likely to leave their child uncared and unnurtured at home. At PBSNS we do not treat LD, it is beyond our expertise. 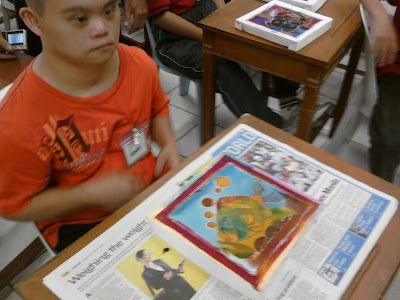 What we do is provide opportunities to help LD persons bring forth their hidden or underdeveloped skills. My Comment: Typically we observed new trainees to be quiet or lacking confidence when they first join the centre. This may be normal as they need time to adjust to new environments like normal persons. But at PBSNS our joy is to see such LD persons surprising us with abilities we thought were untrainable. Low self esteem is a common problem that we can definitely help by fostering a warm and loving work environment. We do have a suicide case but she has gain tremendous confidence with us. I believe we have helped her out of her depression through encouragement and love. LD people need lots of love to grow out of their perceived problems. We cannot deny that media people want to know about our work. So far we have had Star, NSTP and Utusan Melayu publicising our community service. RTM1 and 2 have also filmed our activities for broadcast. Community service work are newsy although some may consider it boring. They serve to counter-balance the many negative reports we read about politics, tragedies, financial woes and crimes. Happy news may not draw much attention but they certainly encourage readers to the fact that there are better sides to the human race. 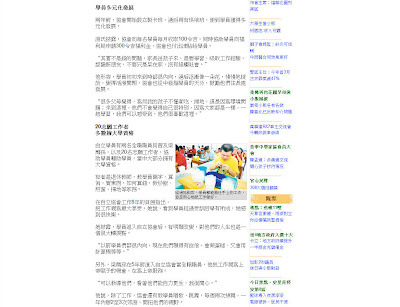 News about helping the disadvantaged people are definitely good news and I am happy that China Press had sent its reporter to our premise this morning to interview the caregivers as well as trainees. For one hour she soaked in the spirit of our work and learned why we were so passionate. At the end she went away buying some of our greeting cards because, she said in her own words, 'she like to help the needy'. I believe we have touched her heart. 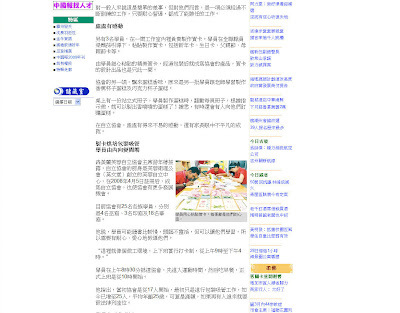 In the coming days we look forward to see this report in the China Press paper. 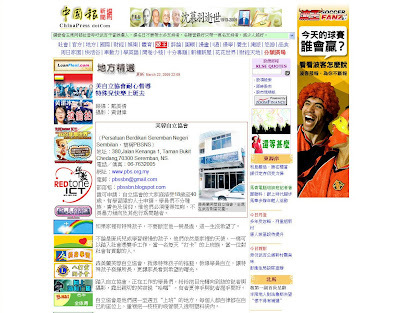 It will add further awareness to the Mandarin-reading subscribers. And prayfully give them another avenue to show their charitable hearts. This morning the Chairman was at the Mawar Renal Centre to receive a donation from the N.Sembilan Tai Chi Qi Gong 18 Gaya Association which also gave out donations to 7 other beneficiaries. 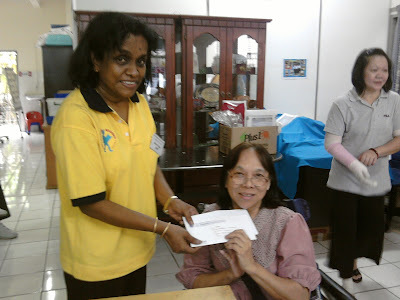 Although the donation was for RM500 it represents a recognition of our work by the Chinese social clubs in Seremban. Last month we had received another donation from the Chin Woo Association. On hand were reporters from the Chinese presses. Hopefully news of our work will continue to dissipate throughout the state and nationwide. The political development in Perak over the past week has a lesson that we in the welfare services can learn from. As much as you and I are dismayed by the manner the power transfer took place, citing the constitutions and the unquestionable authority of the royalty, the very essence of good governance through the electoral process was conveniently ignored. Abiding the law is good but it is still subservient to abiding the conscience of the people at large. Amidst the change of government lie a very serious issue of what service is all about. Do one need to be in power to serve? What are the hidden agendas of wanting to get into power? How can this development be a lesson to societies like ours? 1. We must remember we are elected to serve and to fulfil the obligations of what our vision calls us to be. Being in a position to serve, which means being given authority, empowerment and publicity, can tempt an officer of the society to aggrandise self beyond our call to duty over time. We need to constantly hold ourselves in check if this temptation rear its ugly head and to remind ourselves that while we may be the bigger cogs in the design of our work, yet they still need smaller cogs to make the society operate smoothly. 2. Our positions are given to us because the people who put us up trusted us to discharge our work faithfully, fairly and without any self interest. If possible, sacrificially. As easily as we are put up we can be taken down. We need to preserve our reputations as good stewards of the offices we are placed in charge. We may be able to deceive men but God is all-seeing. 3. The fear of God must remain central in whatever we do. Services to the disabled and the needy are in line with the characteristics of a compassionate God. 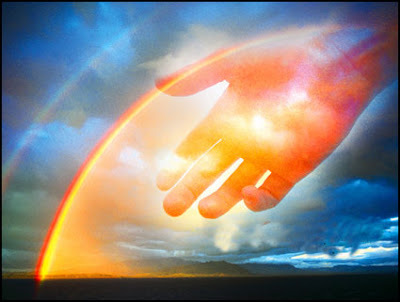 As long as what we do are aligned with God's will He will bless our work and enable it to be taken further. But as soon as disunity, dishonesty and disorder overcome us then we have allowed evil to permeate our work and dissociate with the intention of God's will. Often societies fall through such developments. The Perak lesson reminds us to stay alert to any signs of putting self above service. If we are unable to control the desire to use our work for self gain it is better to step down than let the society be affected. The society will profit from the services of its officers and workers if there is love and common desire to build it up. I have hope that more of our politicians will see this as their real purposes in public services. Happy Chinese New Year to those of you who are celebrating. I hope the symbol of the ox represents strength, wellness, perseverance and, especially pertinent this current year, ability to endure hardship. Believe it or not, hardship is part and parcel of our very existence. It is folly for anyone to wish for a good life every day of our lives. Rather it is wisdom to be wishing for strength to sustain hardship and inconveniences. Is it possible that we apply the same Vision to our society? Is it possible that we become self sustaining and self relying one day? Hard thought and tough target to be addressing at the start of our 'life'. It is my belief that nothing is impossible (without pushing our desires beyond human possibilities and trying for the moon) and beginning to think, plan and do something about it can actually bring us to that place where vision starts becoming reality. It involves much work, many tears and frustrating moments as well as many partners to hold us up. It is possible, only if we believe it to be so. Do you agree with me?